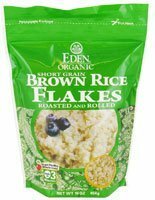 Resealable Package Heart Healthy Whole Grain Cooks in 3 Minutes Kosher Pareve OCIA Certified OrganicLundberg California short grain organic brown rice. Fire roasted and rolled into delicate flakes. Deliciously mild and sweet. For hot cereal or entree, in soups, stews, muesli, granola, cookies, pie crust, baked goods, and desserts. Heart healthy 100% whole grain. Excellent for the very young to the very old.